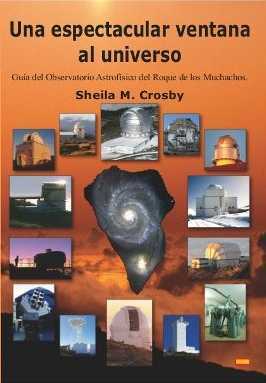 Han llegado nuevas existencias de “Una espectacular ventana al universo” y está a la venta otra vez. 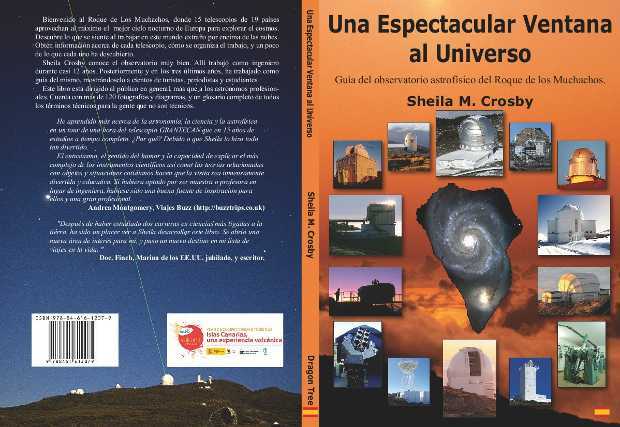 Se han agotado las existencias de “Una expectacular ventana al universo”. Hemos perdido más, y deben llegar al principio de deciembre. Perdone las molestias. Sheila Crosby, author of “A Breathtaking Window on the Universe” and “Una ventana espectacular al universo“, is the main presenter of the Canarian tourist board’s new video about La Palma. With footage of the huge GTC telescope. A Breathtaking Window on the Universe is on sale. I hope to arrange more outlets soon. The book is also be on sale from this website, 12€ + P&P. 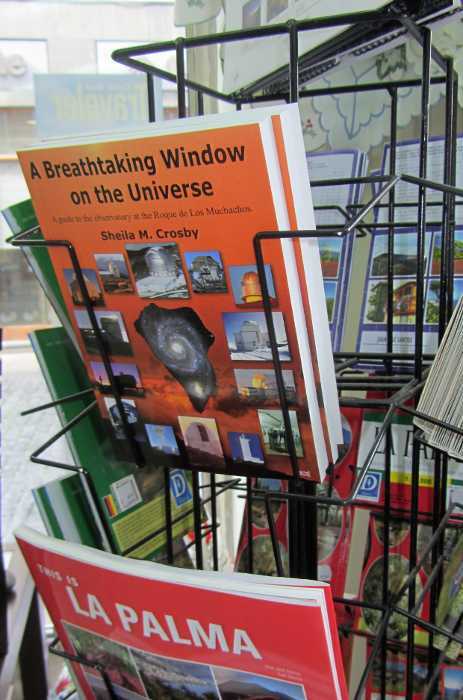 “A Breathtaking Window on the Universe” has shipped. 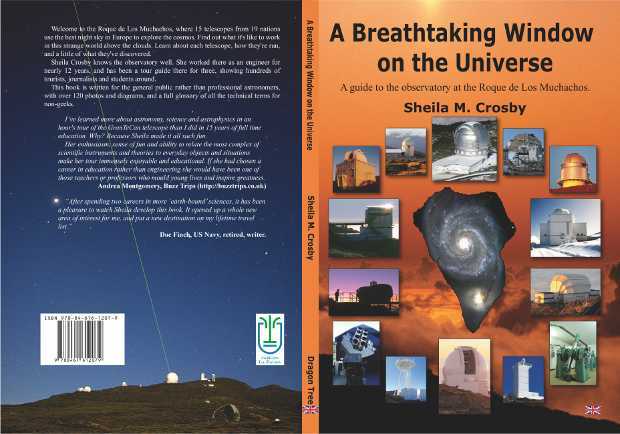 200 copies of “A Breathtaking Window on the Universe: a guide to the observatory at the Roque de Los Muchachos” have left the printers in Seville, and are on their way to La Palma. The printers say they should arrive in two weeks, but it may be a few days longer since this is one of the smaller islands. The recommended retail price is €15, but books bought through this website will cost just 12€ + P&P. The translation to Spanish is 50% complete. The cover for "A Breathtaking Window on the Universe". 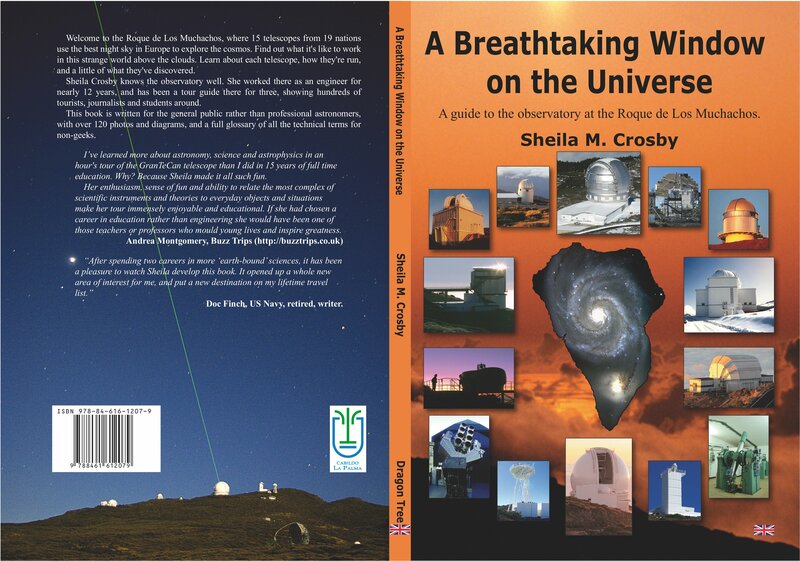 “A Breathtaking Window on the Universe: a guide to the observatory at the Roque de Los Muchachos” has finally been sent to the printers. Copies should be on sale on this website by the end of November, price €15 for 148 pages, A5. I am currently investigating the possibility of selling the book on Amazon. I’ve learned more about astronomy, science and astrophysics in an hour’s tour of the GranTeCan telescope than I did in 15 years of full time education. Why? Because Sheila made it all such fun.